How effective is IT in your company? The VIE IT Snapshot℠ answers this key question for enterprises of all types. It is very difficult for in-house staff to have a clear, objective picture of exactly how effective your IT is. From strategy and business outcomes to system architecture, applications and processes, company culture to asset management and security, IT has the most impact on your business operations and is the most complex and rapidly changing component of your enterprise. Only an outside perspective by established executives who know your industry, your business, and what IT can do to optimize performance should provide this assessment. At a minimum, the VIE IT Snapshot℠ helps a business reclaim an understanding of how and why its’ IT organization works the way it does. VIE’s expert CIO consultants, strategically selected based on industry-specific experience, will grade your current IT investment and provide a high-level roadmap for future success. The VIE virtual CIOs who perform the IT Snapshot typically help formulate strategic goals, and often sit on clients’ executive boards. Their mission is to align the strategic concerns of any enterprise with its information technology architecture and systems – with increasing emphasis on information, as information breeds knowledge, and knowledge breeds success. By implementing the recommendations of the VIE IT Snapshot℠, a business can transform IT into a strategic value-adding part of the organization. Do we know the real value IT adds to our organization? Are our IT expenditures focused on the highest value initiatives? Is IT helping ensure our compliance with key laws and policies? Are we capable of selecting – much less implementing – a key software package that is vital to our future business success? How can IT bring competitive advantage to our company? How can IT help drive improved performance of the critical departments in our organization? How can IT increase productivity and reduce our need to hire more people? How can IT protect our intellectual property and business secrets? Which of all the cool, new technologies can truly help our organization? Is IT helping ensure our compliance with laws and policies? 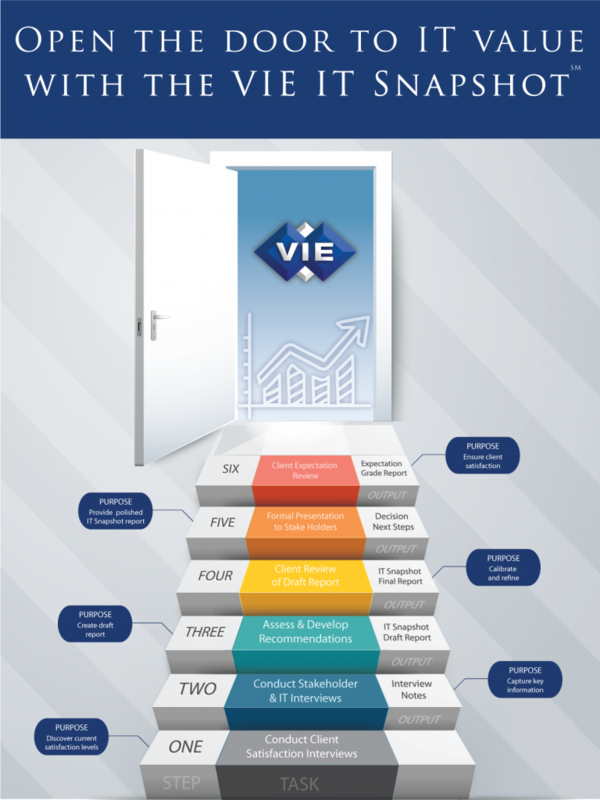 VIE helps to bridge the mystery gaps in your organization, aligning IT with your key goals by answering key questions related to technology investments. When alignment exists between IT and the business, other mysteries are solved as well since good technology leadership fosters business success – not to mention better employee morale and retention. How well is your IT positioned to deliver business success? Is your IT organization and IT people working for you? How well is your IT infrastructure performing? Are your IT application systems providing the level of business automation that you expect? Do you have access to timely information for making key decisions? Are your IT projects completing on time and providing ROI to the business? How does your IT spend compare to your peers in your industry? How about security? Are you adequately protected? How well are you positioned for that inevitable disaster? Could your IT bring more opportunity and higher performance than it does now? Have you asked yourself these questions recently, perhaps even regularly? VIE can help, and we would enjoy learning about your unique story. Feel free to leave a comment, or contact us today. Outstanding service offering and very well presented! Thank you, Marc. We appreciate your support and feedback! Thanks, Suketu – We value your feedback as a blog subscriber. Others are welcome to subscribe, here.